When it comes to naming a successful manufacturer of DLP projectors then Optoma stands at the top. It is a leading projector manufacturer that has been developing a wide range of projectors starting from 700$ and then the range goes on to a big amount as per the quality parameters. Whether you need a DLP projector for office, classroom, or a home theatre projector, Optoma has one for you. Optoma is not only the best projector brand for DLP range of projectors, but they are known for portable projectors as well. Along with projectors that are good for business purpose and home use, Optoma has manufactured Pico and gaming projectors along with projectors for iPhone and iPod. With a big name in the market of DLP projectors, Optoma has always been offering a good warranty and appreciated customer and technical support. Loaded with high-end features, projectors from Optoma are good in color, brightness, resolution, connectivity, and protection. The best Optoma projector comes with features like remote management, built-in security, message broadcasting, and compatibility with Xbox, PS3, and Blu-ray DVD using HDMI X2 components. The best Optoma projector supports 1080p HD picture, high contrast ratio, and high brightness to enhance the quality of videos, games, or images. 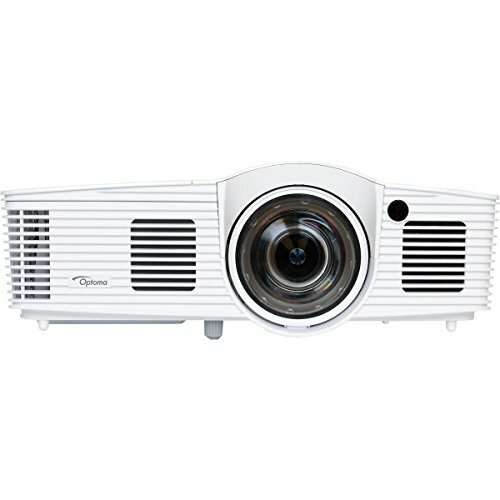 These projectors can support up to 300 inch display, as they are loaded with TI DLP chipset and BrillianColor technology. So, if you have a bigger display, no need to worry about, as Optoma’s BrillianColor technology will support the bigger display without any distortion, which means pixels will not appear (or, will be too less to observe from a distance of a few feet). If you are not much aware of the projectors, chances are that you have still heard about Optoma. That’s called brand power, which Optoma has earned in years. And hence, we have come with a list of amazing projectors by this huge brand. Belonging to the H series, HD142X and H183X are quite similar in specifications. And to be precise, the HD142X is sort of an upgraded version of the H183X. DLP projection has been chosen by both the projectors for 3D picture projection. On comparing the visibility levels of the pictures projected by each, the H183X having 3200ANSI Lumens is a tad bit brighter than the HD142X with 3000 Lumens. But what puts HD142X ahead of its simpler 720p sibling is its 1080p Full HD resolution. sRGB color management system has been used to augment their color saturation levels and more distinguishable picture. Connectivity features are abundant and include all the normal HD features and MHL as well for smartphone connectivity. If you prefer short throw, consider buying the W303ST which has a throw ratio of 0.52:1. To make the picture quite easily visible in any kind of light conditions; Optoma has instilled this projector with 3000 lumens of brightness and a superb 18000:1 Contrast ratio. The resolution offered by this machine is 1080p which again is a viable option for movies or HD gaming. Equipped with DLP technology, the W303ST uses BrilliantColor Technology by Texas Instrument. Now the GT series by Optoma has been shaped especially for gaming and the projectors from its Darbee series that we have shortlisted are GT1080 Darbee and HD29 Darbee. Both the projectors feature 3D DLP projection, with a resolution of 1080p. Comparatively, the GT1080 Darbee has a very short throw of 0.49:1, whereas the HD29 Darbee 1.48 – 1.62:1 throw ratio. MHL which is considered a great connectivity feature for connecting smartphones is also a part of their abundant connectivity options. Lumen count for the GT1080 Darbee is 3000ANSI and that for the HD29 Darbee is 3200ANSI. And to augment the super-bright picture offered by these projectors, 28000:1 is the contrast ratio for GT1080 Darbee and 30000:1 for HD29 Darbee.